Although the Franciscan breviary contains the feast of St Charles on November 4th and indicates that he was Cardinal Protector of the Friars Minor, it fails to mention that he was also a Franciscan Tertiary. The fact is that he was a close follower of the Poverello, a prelate according to the heart of St Francis, and he deserves to be recognized, honored, and imitated as one of the greatest saints of the Third Order. In his life of St Charles Borromeo, Orsenigo says that "enrolled in the Third Order of St Francis, he not only faithfully wore the habit... but above all... took the poverty of St Francis of Assisi as the model for his life." 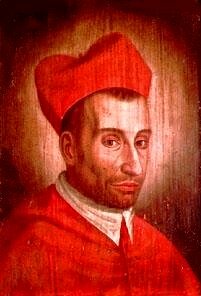 Saint Charles Borromeo was born in the castle of Arona in 1538. His father was Count Gilbert Borromeo; his mother belonged to the Medici family; and his uncle was Pope Pius IV. It may seem strange to hear that he received the tonsure and was appointed a titular abbot, which entitled him to a big income, when he was only 12 year old; and that 10 years later, before he was ordained a priest, his uncle called him to Rome and made him administrator of the Papal States as well as the archdiocese of Milan, and also a cardinal. However, Cardinal Borromeo, who was then only 22 years old, was an exceptional young man, endowed with extraordinary gifts of mind and heart, deeply spiritual, and devoted wholeheartedly to the welfare of the Church. It was due to the young cardinal's vigorous efforts and leadership that the Council of Trent was re-opened and carried to a successful conclusion three years later, in 1563. In that same year he was ordained a priest and consecrated a bishop. The archdiocese of Milan was in a deplorable condition; and in 1565 Pope Pius IV yielded to Cardinal Borromeo's request and permitted him to go to his see and personally to set things in order and to carry out the decrees of the Council of Trent. Saint Charles Borromeo remained there for the rest of his life; and the reform of the Milan archdiocese was his great life's work. It is amazing how indefatigably he devoted himself to his work and how much he accomplished. In 1569 an attempt was made on his life. A bullet struck Saint Charles Borromeo as he was kneeling in prayer, but he was miraculously preserved from harm. Far from stopping him, the difficulties he encountered only made him so much more dogged in carrying out his program. He never tired of visiting the parishes; he established the Confraternity of Christian Doctrine for the proper instruction of the children; he saw to it that the sacred liturgy was carried out in a worthy manner; he founded the Oblates of St Ambrose in order to lead the priests to personal holiness; and he conducted 5 provincial and 11 diocesan synods. But it was the example of his own saintly life that made the deepest impression on his flock and produced the best results. He was indeed an exemplary Tertiary, a true son of St Francis. He avoided all personal finery, and his clothes were so shabby that even beggars thought they were unfit to be worn. He was ingeniously humble, and was careful to hide his merits, his penances, and his private devotions to that no praise might come to him. He did not hesitate to wash dishes, to enter the dirtiest hovels of the poor, and to instruct a poor man by sitting down with him along the roadside. When a pestilence broke out in 1576, Saint Charles Borromeo remained at his post in Milan, and personally ministered to the sick and dying. He succored the poor until his funds were depleted; and then he sold his possessions, including his bed, to procure means to help them. After that he no longer encountered any opposition. Rich in merits, esteemed by all, he died in 1584, only 46 years old. He was beatified in 1601 and canonized in 1610. His tomb occupies a place of honor on the altar of the chapel in the crypt of the great cathedral of Milan. The body of the saint was checked after it was found that there was a great deal of moisture in the vault. The outer coffin was corroded, and the lid of the second coffin also rotting. The dampness had obviously surrounded the saint, yet the body of St Charles Borromeo was found incorrupt. Saint Charles is venerated in a special manner as a patron against pestilences.